Ah, NaNoWriMo: the longest six months of the year. As any writer who’s attempted it can attest, NaNo is an amazing experience, but can also be frustrating, exhausting, demoralizing … sometimes at the same time! As we hit the halfway point of November, here’s a post that you can relate to if you’ve ever tried National Novel Writing Month, or if you need something to procrastinate before you burst into tears write again. Happy writing, everyone! 6. When you finish your word sprint and you realize you finished your chapter! 27. When you have just one more day to go! 29. When you’ve finished your novel!! 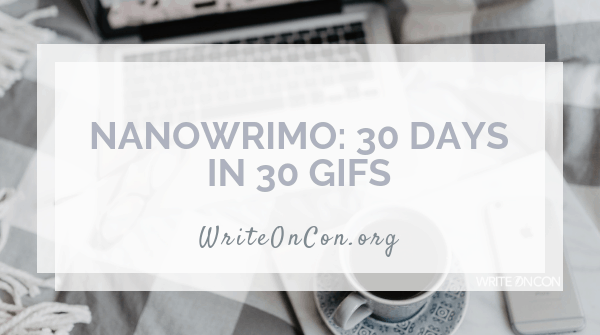 Share a GIF of your current NaNoWriMo mood on social media and tag #WriteOnCon so we can cheer you on!